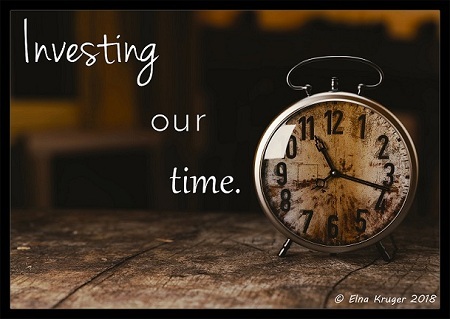 How well do you invest your time? How valuable is time to you? Especially in this season of being a homeschool mom. Why does one ask this? And does it matter now? In economic terms anything that is scarce or rare or in limited supply and is useful, is VERY valuable. Also in economic terms if you mention the word ‘investment’, one thinks immediately about money, and how to invest money so that it may increase in value. In a homeschool context, however, TIME is the more valuable resource and we shall expound on that. Time is the one resource or commodity that we all have in limited supply – so we should therefore see time as extremely valuable. Let us use the well known example of finding out that we have only a few weeks or months or years left to live. Immediately after hearing the news our priorities will change drastically and we plan the use of our time very differently than only a few minutes before when there was a “seemingly unlimited” amount of time available. The effect of this is drastic and immediate. The first result of the news is that we quickly identify what the most important priorities in our lives are. Most people will decide that relationships are important. Most people will quickly set their affairs in order and then spend much more time with loved ones, family and friends as well as preparing them for the time when they themselves are not around anymore. Since this is a homeschooling forum, let us zoom in a bit and assume that we have a few years left - just enough until our kids are young adults. The question now would be: What are our goals with respect to investing the time we have left, in preparing our kids for the rest of their lives? · Helping our kids to explore and discover who they are (identity) and what their unique combination of gifts, passions, genius and talents are. · Giving them a strong moral and spiritual foundation (integrity, honesty, etc.). · Equipping them with basic skills (communication, reading and writing, life skills etc.). · Facilitating exposure to a variety of knowledge/subject areas so they can discover what their interests are. · Giving them a broad overview of what is going on in the world (explaining worldviews and different perspectives). · Helping them to explore their ‘place in the world’ deeper as it relates to who they are and where their interests are leading them. · And finally helping them attain a formal qualification or skill in line with the above. All of the above flows from our relationship with them and as homeschoolers we have the privilege of spending MUCH more time with our kids than in a normal schooling setup. This fact should make us more careful and not careless about how we spend time with them. We should still view time as precious and use it wisely. Another interesting thing about the list of goals mentioned above is that money cannot buy these for you or your children. There is also not one right strategy or answer on how to achieve the above. Often we wish it was as easy as just ‘getting the right curriculum’...but it's not...it's making the best decisions you know how to make, with the information you have at hand and with the guidance you feel you have. This the reason why homeschooling is such a unique and challenging experience - it is a journey you and your family must navigate for yourselves as you continue forward. · Are you satisfied that enough time is invested in your relationships with your children? · Is enough time invested in achieving your and their goals? · Can you see your family moving towards achieving these goals or moving away from them? Sometimes the problem is that the goals are not clear – then attend to that, think it through and define something that makes sense to you. Remember that having good relationships with your spouse and your children are worthwhile pursuits in themselves. Sometimes the problem is that there are too many goals – sit back and think well about what to focus on for this season of your life, and what should not be a priority for now. Sometimes the goals are not enough – watch your children and monitor what their real needs are, then develop goals that will challenge/stretch them just a little so they can grow into character.